These are printed at 9,600 dpi giving you a decal that will look like it is painted on! 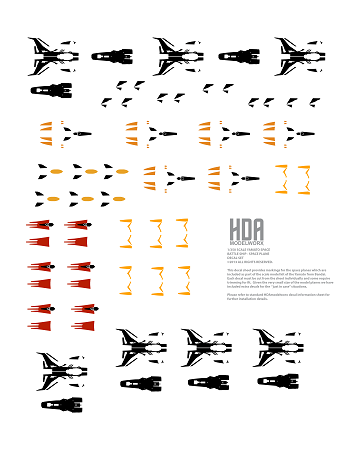 These decals have been developed to fit the small space planes which come in the Bandai 1/350 scale Space Battleship kit. Developed in conjunction with Boyd Crompton, a.k.a, TREKWORKS on YouTube to provide modelers with an alternative to trying to paint all the details on small kit parts. These decals provide details for around the cockpits, wings, underside, etc. and must be individually cut from the decal sheet. Many are best installed by cutting into sections which will make for an easier installation. Not all decals on the sheet will be used, but several extras of each are provided to assist the modeler. Given the design of the decals photo references form the movie should be used for placement. Unlike other decals from HDAmodelworx these decals are considered for advanced modelers and as such no installation instruction sheet is provided. Q: Is there any chance that these decals will be printed out at 1/500 for the aircraft supplied in the Bandai Yamato 2199 in 1/500th scale? Thanks! A: Johnny, not really due to the fact that I do not own that model. i would need a copy of it to make sure everything fit. A: I am sorry, but as of right now there are no plans to scale these to other sizes. We might in the future, but we haven't had enough requests for that scale. Q: Do you have decals for the 1/500 Bandai Yamato fighters? A: Sorry, I do not. I would need the model kit to create them.